Through door-to-door sensitization of communities, 40,000 households have been reached with messages promoting consumption of diverse and nutritious food for improved health and nutrition. In addition 2500 women have been trained on healthy cooking and an additional 3000 have been trained on nutrition education. These activities are part of a larger endeavor to mainstream changes in the knowledge and practices regarding dietary habits among the communities. One aspect of this is providing training with an emphasis on drought tolerant crops. 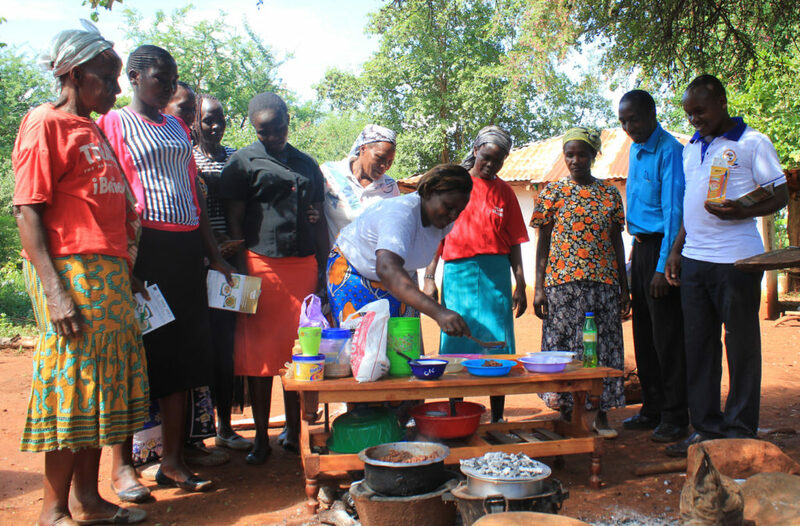 Using a participatory approach, rural women and men in Tharaka Nithi county were trained on preparing nutritious and palatable meals using drought tolerant crops, for example, pearl millet chapati (bread), sorghum-cowpea pilau, sorghum cake, pigeonpea chapati, sorghum-green gram stew and a traditional pearl millet drink known as Kinaa or Mburugi. 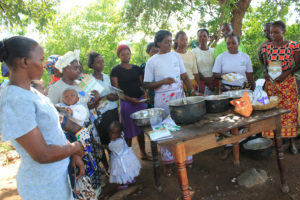 In addition to influencing dietary practices, maintaining hygiene during meals preparation and tips on energy saving cooking techniques were emphasized. Drought tolerant crops including sorghum, millets, pigeonpea and groundnut are ‘smart’ crops because of their high nutritional value, high resilience under extreme weather and the potential to improve incomes of smallholder farmers living in very dry areas. Lydia Muthoni and Harriet Kareithi conducting a class at Nairobi Ndogo village. 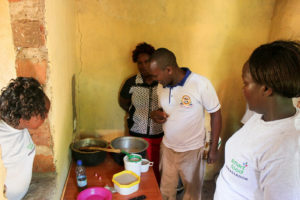 The cooking demonstration commenced on 10 April and was attended by the county Agriculture Officer, Mr Walter Mugambi. While addressing the group, he appealed to them, not to rely on relief food but diversify their food intake by farming and consuming smart food. He also urged them to be good smart food ambassadors and promote their improved practices among their communities. 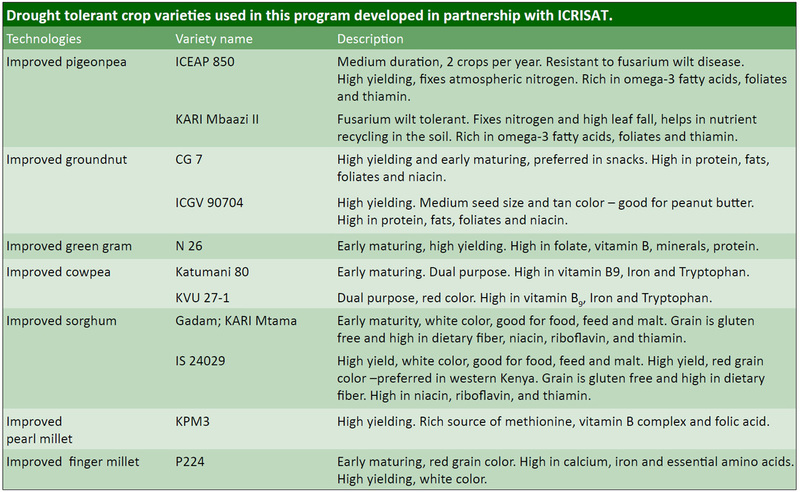 In this program, ICRISAT is working in partnership to mainstream drought tolerant crops across the value chain: distribution of improved varieties of drought tolerant crops, training farmers on proper agronomic practices, conservation agriculture, harvest and post-harvest practices, value addition, cooking training, nutrition education, and working with small and medium enterprises to develop new healthy and tasty smart food products.